You might remember my list of 101 Things. I confess, I'd sort of forgotten about it, what with planning a wedding, finishing my senior year of college, and moving from Alabama to Illinois to Missouri. 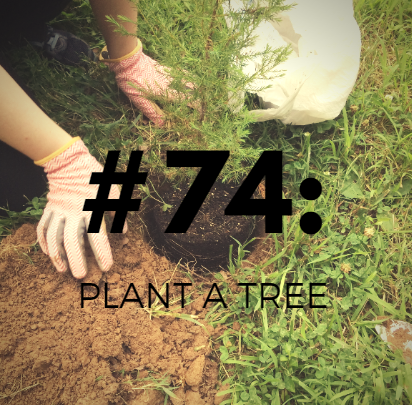 However, I have been slowly (and often obliviously) performing a few of these 101 tasks, and one of them, #74, turned out to be pretty noteworthy. At least, I think so. Back in the homeschooling days, I clearly remember watching video after video of Auntie Litter teaching environmental responsibility. You know, Auntie Litter deserves more cred. 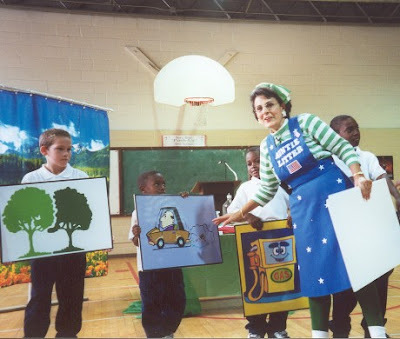 With her patriotic apron and catchy jingles, she taught kids to reduce, reuse, and recycle way before it was cool. Her videos taught me early on about the dangers of pollution and completely ingrained in me the desire to plant trees "for all the world to share". So, for years, I've been purposing to plant one, but I've never gotten around to it. That's why I put it on my 101 Things list. I never guessed that opportunity would arise on my wedding day. Since we weren't exchanging rings, Matt and I wanted to do something special at our wedding to symbolize the two of us coming together as one. 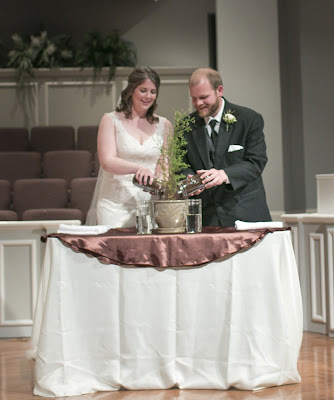 We quickly ruled out the overdone stuff, like unity candles and sand, and after over-thinking it way too much, we finally opted for a tree-planting ceremony. It felt the most "us", and it fit in perfectly with our nature theme. Matthew and Jennifer have chosen not to exchange rings. Instead, to symbolize the roots of their relationship and the continued growth of their love and faith as they become one, they will now take part in the planting of a tree. The planting, nurturing, and growth of a tree provides us with an excellent illustration of a flourishing marriage. Just as the roots keep the tree firmly grounded, love and patience will build a strong foundation for this marriage as it becomes renewed and empowered through the ever-changing seasons that lay ahead. Matthew and Jennifer, today you stand before us ready to share the rest of your lives together as a married couple. But long before today, your parents provided you with a foundation of love and faith in Christ that has brought you to this point. This soil symbolizes your individual families. It has been their years of love, prayers, teaching, and support that have helped shape who you are today- a man and a woman who are ready to be committed to each other in a loving marriage of your own. And also like this tree, marriage requires constant nurturing and nourishment. The water you now pour upon this soil symbolizes the encouragement, trust, and love that is needed on a daily basis to consciously nurture and nourish your connection to one another. 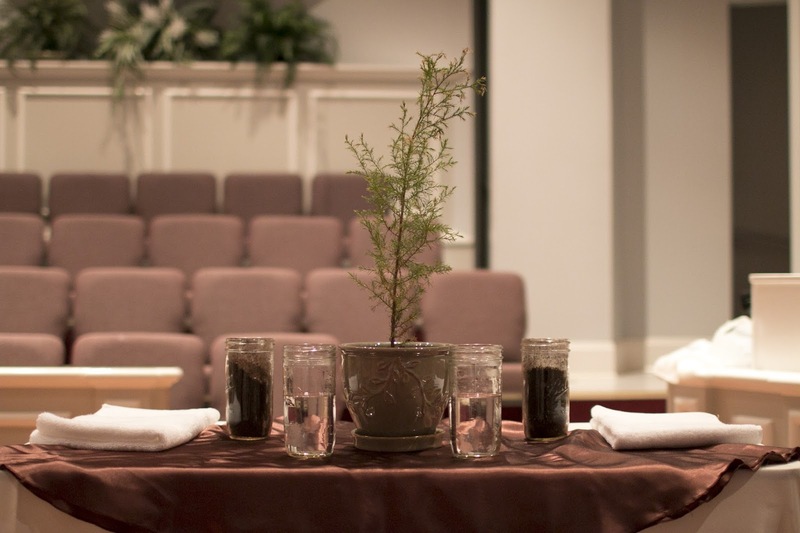 It is the prayer of all of us here that you two will keep your trust in the Lord and let your relationship and your love for each other grow like this tree you have planted today. Let it stand strong during the harsh winds, rains, and storms, and let it come through unscathed. That verse has always been a favorite of mine, and I loved using the image of a strong, aging, weathered tree to represent our future marriage. It was a beautiful part of our wedding, and I'm so thankful we decided to go with that idea; mainly because there was a second half of the ceremony to be completed in private, outdoors, whenever and wherever we wanted. After a month and a half of caring for our little cedar (which was quickly outgrowing its pot), we chose to plant it at the house in Illinois before we left for Missouri. 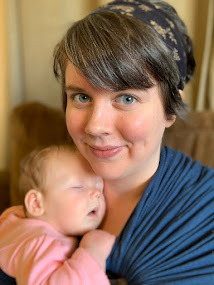 After all, our home in Missouri is a rental, and we don't have permission to alter the grounds. 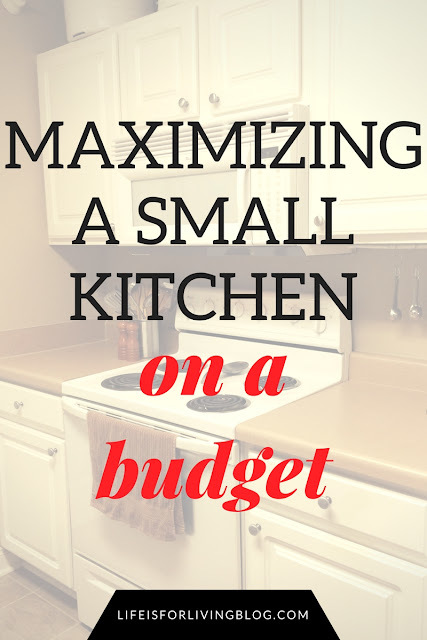 The house in Illinois, part of a wildlife preserve, was a perfect option, especially since it was the first dwelling we shared as a married couple. So, on our last evening in Illinois, at sunset, the two of us selected a spot in the backyard and got to work. It was a sweet, perfect moment: the two of us, sweaty and dirt-stained in t-shirts and tennis shoes, quietly finishing our wedding ceremony at the edge of the forest as the sun set. We realize we may never see it again, but we hope that, someday, we can come back to southern Illinois to see how tall our little tree has grown. So. Pretty cool way to check off #74, huh? This is so sweet! I love the symbolism it provides. 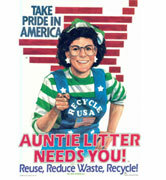 I'm also a little shocked I've never heard of Auntie Litter... what kind of homeschooler am I?